Happy Thanksgiving tomorrow, to those who celebrate it. To everybody else, American consumerism drives the world economy, let us have our fun. When I wrote this I took for granted that the situation would make sense to everyone. Now I’m not so sure. Where I’m from there’s a group who takes buses of mentally handicapped people into town and lets them run amok. They all have to wear huge nametags, with their pertinent information on them in case something goes horribly wrong. (Often something does.) They are very similar to the kind that high school students are required to wear. I imagine it’s because of the various similarities the two groups share. I’m not sure if that’s a local thing or not. 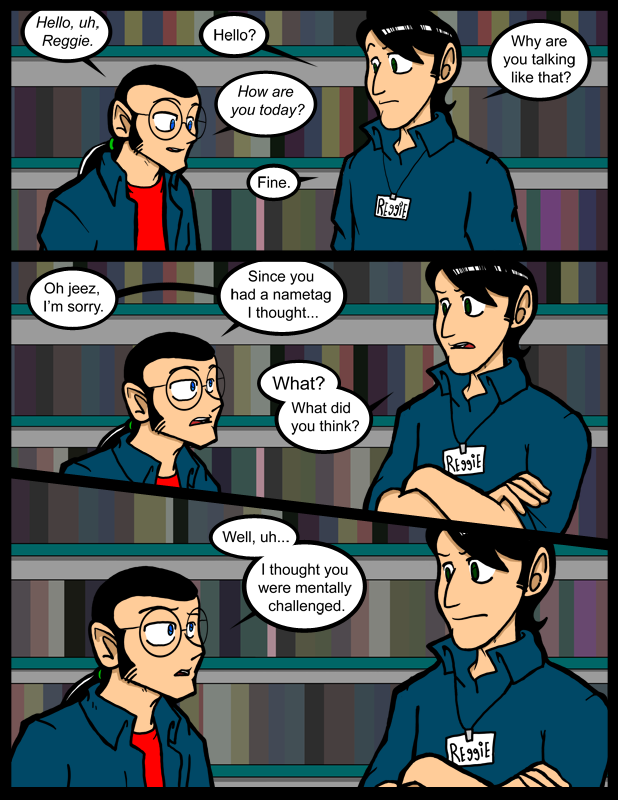 In any case, Reggie didn’t consider this when making his massive nametag. As long as were talking about special people, I’ll be in Garden on December 3rd. Those affected should batten their hatches down. Also, cast page. Check the header, yo. Lol, Big retarded name tag. Ed vs Reggie…IT HAS BEGUN! Crave: Well spotted. Clearly you don’t need an extra large nametag. ROUND 1!! ED Vs. REGGIE!!! FIGHT!!! AND EDWARDO GET’S IN THE FIRST SHOT, CATCING REGINALD OFF GAURD!!! HE GOES REELING!! Yeah, I got the idea about the nametag. I guess it’s not required at Megatainment. PS I love cast pages for some reason. Go you! I feel a short joke coming. Boothe and Lincoln, I only just got that. great stuff. BWA HA HA HA HA XD!! Oh wow! Boothe and Lincoln! very clever. Ok… newfound respect for Ed….. and at once seething rage that he can troll spontaneously too…. which further makes him my clone. This should be good…. if they do it properly. But how will Reggie respond? Will this be a Rule 14 to Ed? I’m never looking at nametags the same way AGAIN. While I’m not sure if I’ve personally seen anyone with such a name tag, I assure you it made immediate sense to me.